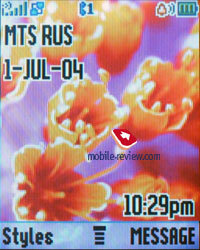 The company of Motorola has staked on designer projects, and Motorola V3 showed the expectations were right. Functionally the model brings nothing extraordinary, but its attractive design charmed many people. 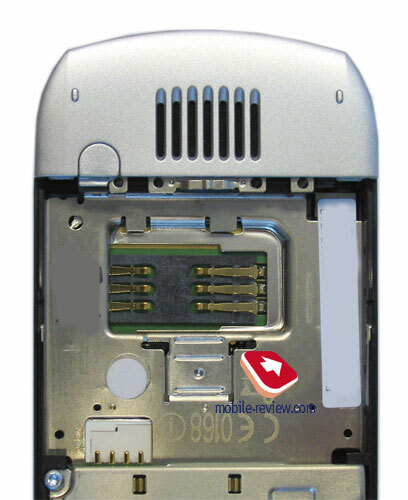 The main features of the RAZR were thin body and metal used in the construction. And ideological continuator is SLVR in a classical form-factor, but distinguishing with small size and the minimal body thickness. And if the RAZR was the first signs then the SLVR opens a whole series of models compatible in characteristics and form-factor but different in price. 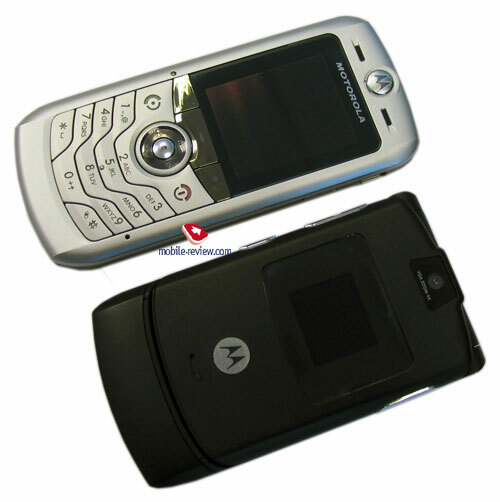 Such models include Motorola V6, Motorola L2 and L6 (earlier known as Motorola SLVRlite and SLVRcam). Here the company stakes on low price and the absence of rivals with close characteristics. 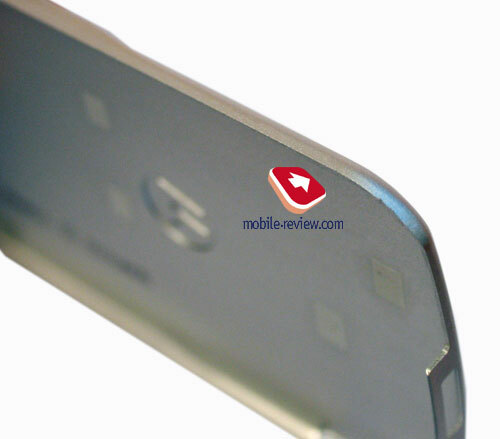 It's an interesting approach, and what is the main - quite workable, which the RAZR proves. Both models are targeted at those people, who wanted to buy RAZR, and didn't do that for some reason. At that, the company at the very beginning leads them to the mid-price segment, which is untypical for such models. The changes in the names are concerned with positioning of the models. 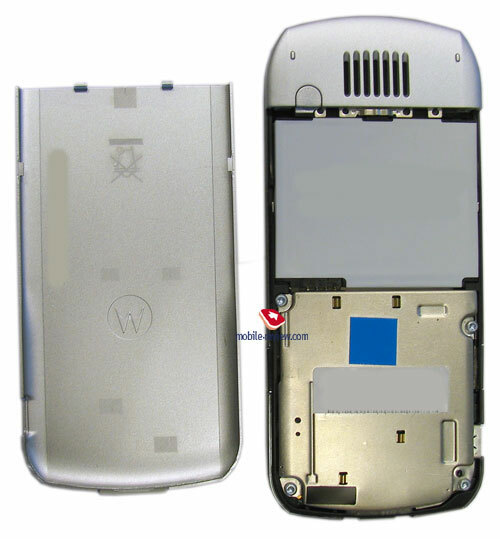 On the one hand, customers got used to clamshells offered within the V-series, on the other hand, a similar in design Motorola V360 is designed usually. The products should be joined in a single series, distinguish them from all other company models, and here is what the L-index was created for. It brings no special sense, and one can think it stands for Luxury or Lite or something like that, but truly that's wrong. Let's remember the company had L-series phones, which were simplified versions of the P-series (for instance, Motorola L7089). By the way internal name of the solution was Lantai, which could have given the abbreviation. The SLVRcam or SLVRlite prefixes are not used any more. To form a complete line the SLVR got the number of L7. And a renamed PEBL also belongs to a new series, now it has the U-index. We are curious to know how the company will play with the new names. Not to discuss both devices together, we'll mention only the differences and then will speak about both phones in one. The elder model is equipped with an integrated VGA camera and Push-to-Talk. Starting with December shipments, EDGE will appear, though now it's absent (and the same situation with other company models, for instance, Motorola v360). 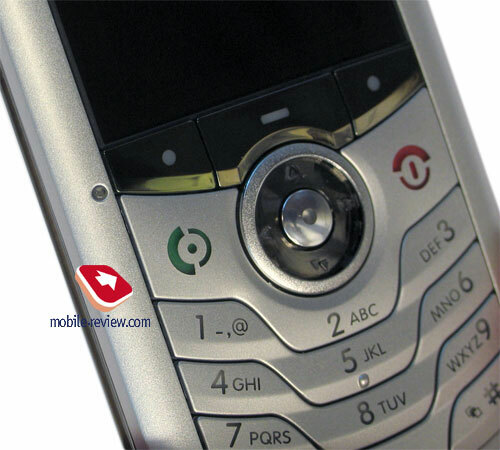 Another difference is the keypad quality, which is higher in the L6 similar to the RAZR, and lower in the L6 being of plastic and looking plainer. Other advantages of the L6 are Java and an mp3 player, but it is of no need due to the fixed memory capacity. These are all the differences, and other characteristics of the models coincide. The design is not very refined, though the device looks stylishly, which is stressed with silvery body material (visually noticeable). 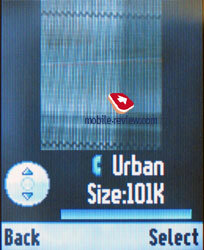 At the same time, the device is thinner than the RAZR and compatible in height (in a closed mode). There are no such small devices on the market (113.5x49x11.5 mm). Carrying it is very comfortable, and its extremely low thickness doesn't prevent from carrying it in a big arm. The weight of the phone also suits this class and forms 85 grams. A miniUSB connector which can connect a charger and a wire headset. 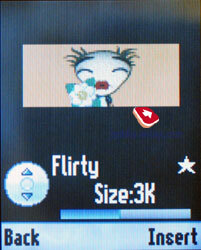 A special button for Push to Talk, selecting this or that menu item (depends on the model and position in the menu) is present. An unordinary construction is here. A microphone is placed on the front panel, in the middle to the right. No microphone is present on the bottom. Our environmental test proved the model has no problems with voice transmission; the microphone allocation influences this parameter in no way. It would be hard to take the device in that way to close the microphone. 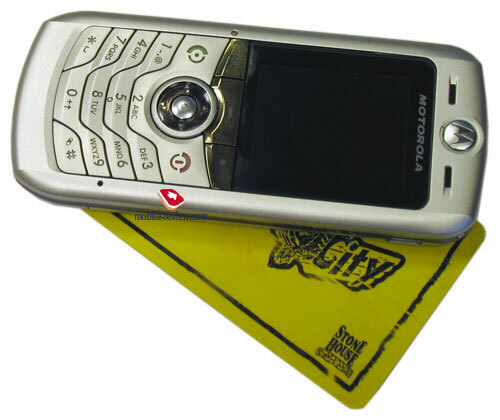 To the left of the keypad a lighting indicator is seen, which is a corporate Motorola's function. 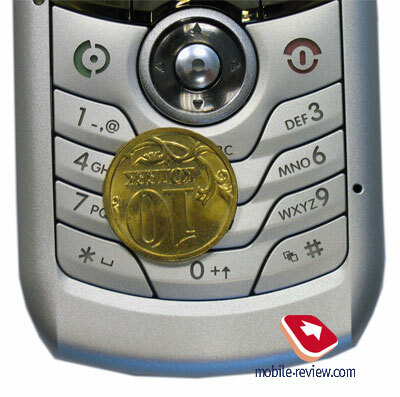 The handset automatically turns the keypad backlighting on in poor light conditions. The backlighting is blue and well seen in all conditions. Thin letters on the keypad may merge in a bright sun. The comfort of using the keypad is average, thus the navi pad may be uncomfortable due to its size. 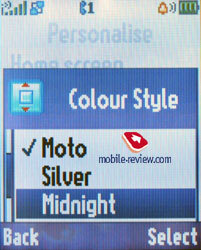 The phone screen differs from a standard one in the latest models; it is STN display with 128x160 pixels resolution. 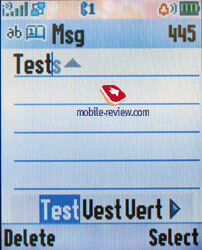 The manufacturer claims this screen belongs to the 4G giving a good result. The picture is bright, but the grain is noticeable. 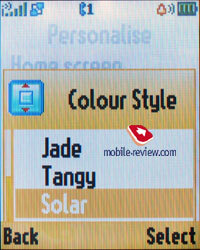 In the sun it fades and behaves worse than Motorola's TFT displays. The display is the weakest point in the product, though for this class not a better matrix should be expected. 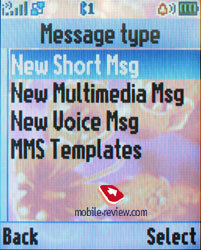 Up to 6 text lines and 3 service ones are held on the screen. The battery having no backlash is behind the back cover. The catch is held on the only clip. The Li-Ion battery is capable of up to 310 hours of work in the standby mode and 3.5 hours in the talk one. In Moscow the phone worked averagely for 3 days in case of 30 minutes of talks and up to 20 minutes of using other functions. Using Bluetooth actively will decrease the battery life to 2 days. 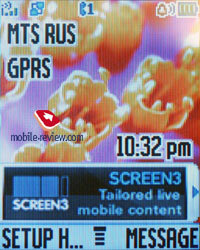 SCREEN3 technology also seriously discharges the battery. In average the model will probably work for 2-3 days, and longer battery life is unlikely achievable. The battery is completely recharged in 2 hours (though the charge indicator shows it lasts for 4 hours, really 95 per cent of the charge appear in the first two hours). About 11.5 MB of memory are dynamically shared among all the applications. 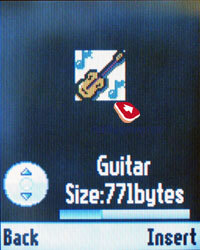 This allows saving own small mp3 compositions to use as a call signal. 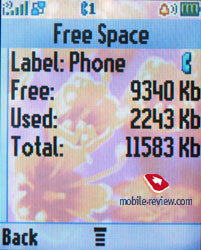 Though, you wont feel very free with such memory size. On the other hand, there is no need in much memory at the absence of a megapixel camera (and the younger model has no camera at all). 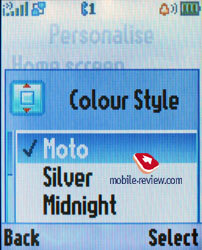 The L2 is one of the first to use the SCREEN3 technology, which is some kind of a banner hanging on the screen in the standby mode. 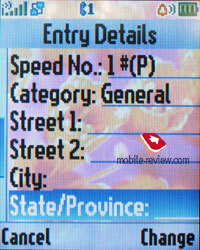 Information about the weather, currency rates and other information reports by your wish are uploaded via GPRS channel. The pages can be scrolled horizontally, various bookmarks are opened. Nothing revolutionary, just the first test of strength. 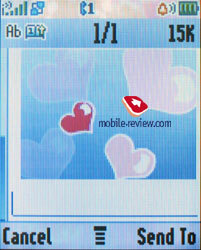 One may like SCREEN3, though mass application of the functions is still in the future. You can access the Main Menu by pressing the Menu key (or an OK button) that is located under the screen right in the middle. 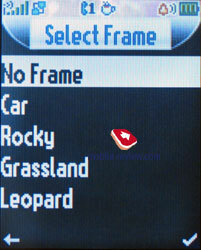 The main menu is traditionally represented as 9 icons with tips for each on the top of the screen. You can switch the appearance of the main menu to the list mode. Then everything will be represented as lists. Half of the submenus is represented as lists and half as icons (if you choose a corresponding menu appearance). 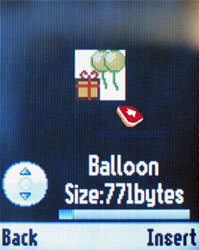 A user may customize the order of the icons in the main menu (or the items in list view mode). The menu does not support fast number navigation, but you can setup shortcuts for almost every menu item or a function. 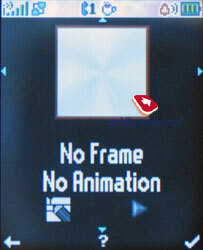 Also various actions can be bind to the navi pad in the standby mode. Two soft-keys can be bind to various actions as well, apart from the default ones. With such menu personalization flexibility the lack of the fast number navigation is not so noticeable. As we have already mentioned, the device supports predictive text input iTap. The current word is shown while input (in the lower service line) and variants of a word to select. When the dictionary is off, all the characters assigned to the button are shown. The device remembers the variants of the words you choose and after that offers them automatically. That helps to avoid entering words into the dictionary as it is necessary in T9. That's curious the iTap technology will be used by other manufacturers in the nearest future, thus T9 will be refused. The information is preliminary but has a high level of trustworthiness. 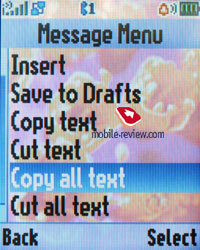 A pop-up menu allows choosing of the two languages for writing text messages or letters. At the same time, input type is set from the beginning - letter by letter or predictive. That is rather a peculiar solution that allows getting flexible settings. I'd stress, the device is intended for mass audience judging by text selection, not so many people use more than two input languages. Phonebook. 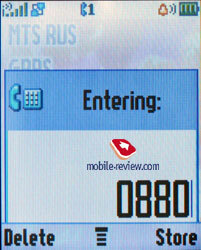 Pressing the buttons in the standby mode calls a search menu, here you can search by unlimited number of letters. Traditionally provided fast switch to a name by the position in the phone book. Up to 1000 entries may be saved in the phone book; a name goes with one number, e-mail address, personal photos and call melody. New fields are called Nickname (used in ICQ and similar programs and has no any straight use here), fields for entering a post address (two fields for a street, fields for a city, state, post index and a country), birthday (but there is no a memo here still). Only one number can be assigned to each. 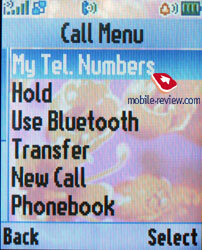 At the same time setting another order of entry representation in the phone book menu changes the phone book greatly. All the entries for a name are hidden behind the name in the general list. 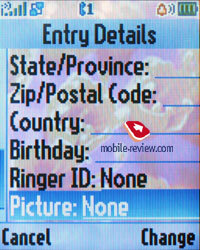 You are not limited in the number of fields and can keep several phone numbers, e-mail addresses. The matter is the representation you have chosen. The plus of the notion is you can select personal call and a picture that will be displayed during a call for each entry (for instance, one user but different numbers). In the general list each name with several numbers may be scrolled with horizontal pressures, icons signifying the type of the number will be changing. There are several users' groups the entries may be distributed among. However I have noticed a small disadvantage - when you are deleting an entry from the phone book, you will have to delete each number assigned to it separately. It's impossible to delete them at once. You are free to choose the style of displaying entries in the phone book: either names with assigned images, or only names, you can also personalize the entry sorting style (quick dial number, name, e-mail address). 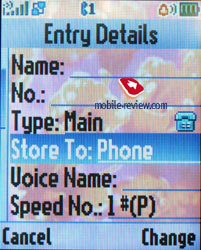 Voice dialing can be setup as well; it works fine in various conditions. The phone book is interesting in characteristics and no similar offers by other manufacturers exist now, all of them have restrictions (one photo for a total name, no photo assigned to separate names, the same for personal melodies). At the same time, the phone book cant' be called ideal in the absence of many fields and it needs investigating the structure. Messages. 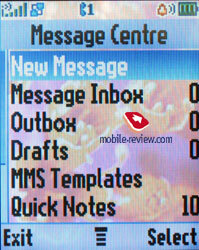 The default memory capacity for 100 SMS is provided; it may also vary depending on the software version. As a rule, operator versions are limited by 40 messages. The device works with EMS. 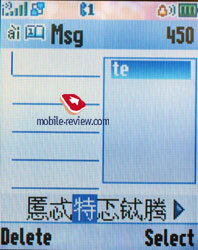 Automatic cleaning of the whole message list should be mentioned as an extra possibility; there is a list of templates. Delivery report may be on permanently or switched on/off for a message. Working with MMS doesn't bring any inconvenience; everything is simple and easily understandable. 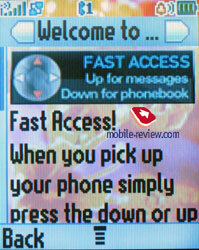 The messages can be attached with pictures made by the built-in camera, sound files. The ten predefined templates are really great, be sure to check them out. The phone has POP3/IMAP4 e-mail client, it allows watching the headers of the incoming mail and download their body as well. 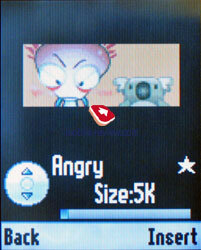 Only graphical files that do not exceed a certain size limit can be sent. In case you want to store some of the e-mails, you will have to use the dynamically spread memory, just like in case with MMS. WAP. 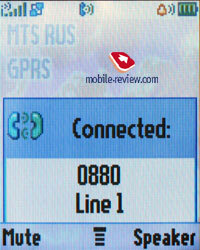 The phone has WAP-browser v2.0 and its possibilities are standard so nothing special can be said. 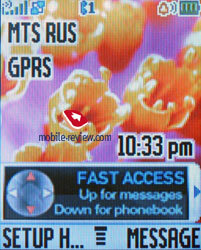 GPRS (class 10) is present, the settings are rather simple, just follow your operator's instructions. Call log. 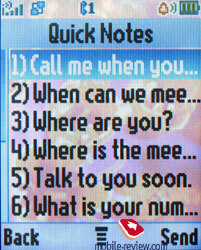 The phone has a list of received calls; it includes the missed ones as well, they may be distinguished by the absent tip. 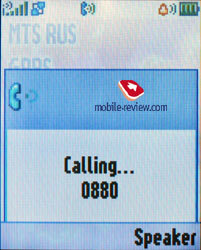 You can also see the list of the 10 last dialed numbers; you can access it by pressing the Call button. Everything is rather simple and traditional, nothing special at all. 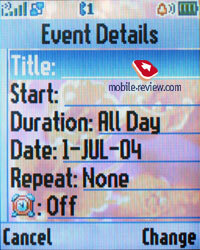 Each entry features the date and time as well as the duration. 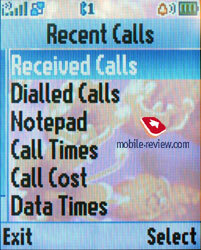 Also this menu shows battery life, last calls, call duration and data connections. Office applications. 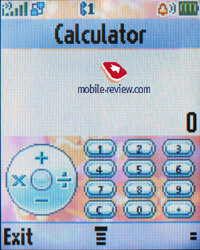 This menu features a whole bunch of office applications such as the Calculator. It's convenient, the full digital keyboard is present on the screen, it reproduces the real keyboard perfectly. 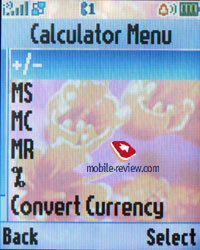 The menu features memory options and the currency converter. Shortcuts are located in the same menu. You can create shortcuts not only for various menu sections, but for a definite wap-site as well. Alarm clock. You can create several alarm clocks and choose a custom ring tone, name and volume, type of reoccurrence (daily, single time) for each of them. 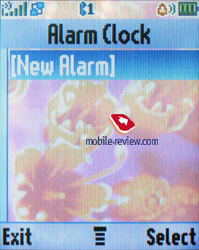 This phone was designed for continuous, that's why entering names and titles for the alarm clocks is required. 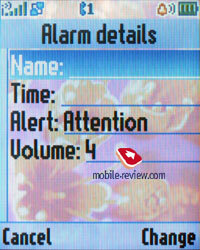 Alarm clocks are activated in one touch, and a note really eases work with them. Dictaphone. You can create records from the stand by mode as well as during the talk. Dictaphone can record the whole dialogue. The maximum length for each entry - 60 seconds, however your interlocutor will hear the sounds (at first it's zoommer, followed by short beeps with a continuous interval). There is no possibility to keep more comments despite the dynamical memory present, only several records up to 60 seconds in duration (earlier the limit formed 120 seconds). The dictaphone is weak especially against a background of the rivals recording up to an hour of talks. In the listening mode a percent of the total time but not a reproduced time is shown, the discontinuity forms 5. That looks hardly comfortable since we all are used to representing record time and that seems logical. Organizer. You can view it monthly or weekly with breakdown for hours. 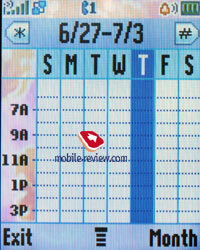 You will see your appointments bind to a certain time of the day, it's convenient. Each entry can be assigned with a name, start time, length (measured in hours, the minimal amount of time - 30 minutes). Warning can be set in advance. Each entry can be reoccurred, this is a big plus. SyncML support is present, it's made for corporative users who are in great need of synchronization with data server (something similar to remote synchronization with Desktop PC, but this time the server must be located in the network). Games and applications. 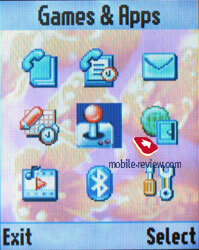 The phone supports Java MIDP 2.0, all applications that are located in this menu item are based on this technology. The number of games and their title depends on where the phone was bought. The most often to find is Rebels (space arcade). Safe is an utility for storing data about credit cards, access passwords and so on. 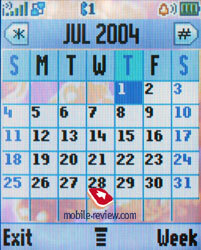 Similar applications are integrated into Sony Ericsson, Nokia, Siemens. Multimedia Album is a new application like for editing various files, you can combine sound, video and pictures in it. 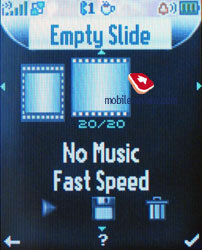 The idea resembles VideoDJ in Sony Ericsson's phones. Multimedia. 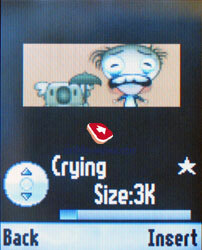 The phone supports themes. It's a set of wallpapers, color schemes for the menu, sounds and ring tone types. You can change the outlook of your phone almost instantly and this is really fun. 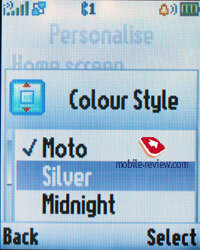 New themes can be downloaded from Motorola's website. The themes haven't changed; there are three of them - a standard, Techno, Neon. 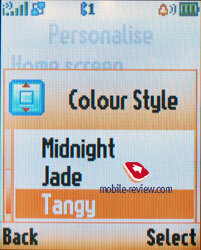 They not only change a colour menu representation but interface windows, the whole interface of the phone changes. MotoMixer - original sound file editor that allows mixing the tracks. You can play with it from time to time; the results may come out rather unexpected and nice. However as the practice shows, these sound editors are nothing more than a toy for most of the users, only few of them take use tool seriously. 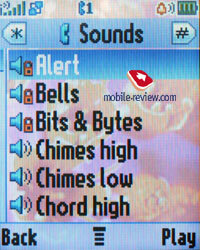 Sounds - information about all sound files located in the phone's memory is stored here. You can check out their size, info and even listen to them. 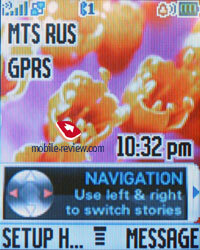 The players is similar to other Motorola's phones, everything is clear and easy to understand. 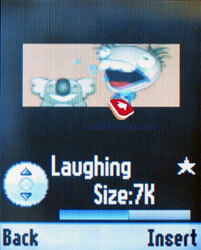 Pictures - list of all images located in the phone's memory. 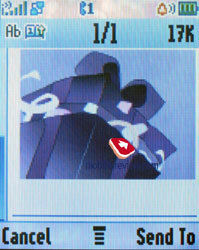 There's a special icon near the file name. Each picture can be set as the wallpaper or screensaver. Pictures can be sorted in categories; this will make the browsing easier. 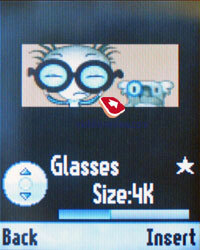 A special editor is present as well, it allows putting frames, changing color scheme and using special effects. The most convenient part is that after mocking the picture it can be stored with a new name. This means that both the original and the new picture will be available for use. This may come handy in case if you want to edit the photo, and not to ruin the original. Settings. 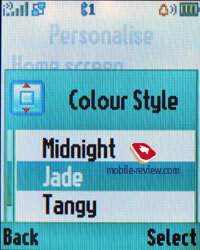 Here you can setup all Display settings including the color schemes. Ring tone type and notification mode (mixed mode, when the vibrating alert works at the same time with the ring tone is present) is here as well. I don't think there is any need to describe the network and security settings since they're all similar to any other phone. The Bluetooth settings remained the same and the device is still seen only for 60 seconds, which is not enough sometimes. Camera (only L6). The device is equipped with a VGA-camera, which is a typical solution well known by all the triplets, no flash as well as any peculiarities. The camera is quite enough to take photos of people and use the photos in the phone book. 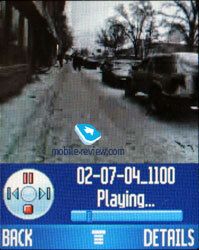 The camera allows not only taking photos but also recording video (3GP). The record may be called from the multimedia menu and then video. The duration of a record may be limited for a MMS or maximum (about 30 seconds). 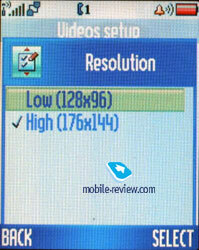 Two resolutions are supported 128x96 pixels and 176x144 pixels. Voice recording may be turned off. The quality of the video is average and the artifacts are seen on the screen. That was hard to expect the device will show any eminent features in recording video and it is typical and doesn't differ from other models. The time that saving the video takes almost equals that necessary for recording and that is a disadvantage. Synchronization with PC. 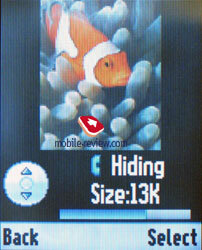 A complete version of Mobile Phone Tools version 3 is included into the package. The program possibilities cover the needs of the majority of users; they include synchronization with MS Outlook, making reserve copies on the PC, copying photos, melodies, writing messages on the PC. The model brought no discoveries in connection. Though brought no problems in the quality of connection being a typical today device. The musical component is on the level of triplets, mp3 files are played back, and the restrictions are not very burdensome. The call signal volume is above average, and a good 24-tones polyphony for midi files is present. The vibra is average or a bit higher. The loudspeaker volume during a conversation is enough almost in all conditions. 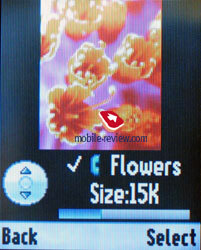 Both models are characterized as plain phones with unusual design for this price group. So, the appearance is a undoubted strength and the functionality is average for this class. The phones ate nice to deal with and rouse liking, as well as the RAZR. The shipments are to start in the middle of September, the L2 will cost about 175-185 USD and the L6's price forms 200-210 USD. Due to the absence or direct rivals these models will be demanded, wince not everybody searches for the max functionality for a moderate sum, some people look at the style of the solution, which is impressive in both models.